Egg protein has the highest biological value because of its combination of essential amino acids and sulfur containing proteins, all of which can be used by the body for natural, healthy muscle maintenance. In addition, egg whites are high in protein and contain no cholesterol or fats. This helps you reach your optimal protein absorption without worrying about taking in unwanted components. MRM´s All Natural Egg White Protein is perfect for all age groups and active lifestyles. It offers a source or protein that is 100% derived from egg albumen. Produced from a superior extraction process, our egg white concentrate provides a foundation of essential amino acids that mixes easily and tastes better than traditional egg white proteins. 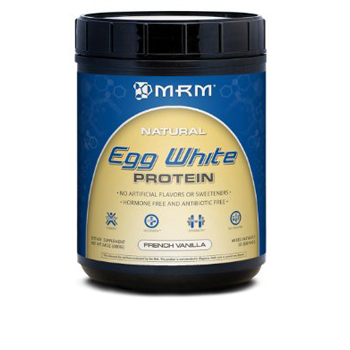 All Natural Egg White Protein contains at least 23 grams of protein per serving and NO artificial flavors, colors, or sweeteners. This state-of-the-art formula uses all natural flavoring and is free of any dairy products.